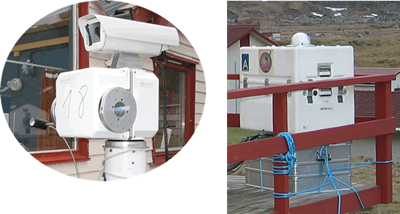 Within the NDACC framework, BIRA-IASB participated to several UV/VIS intercomparison campaigns: Lauder (45°S, 170°E; New Zeeland) in May 1992 (Hofmann et al., 1995), Observatoire de Haute Provence (44°N, 6°E; France) in June 1995 (Roscoe et al., 1999), both with focus on stratospheric NO2. The last one, is a high latitude intercomparison campaign that took place in Andøya (Norway) in Feb/March 2003, when the NO2 columns are expected to be minimum in the denoxified polar vortex. 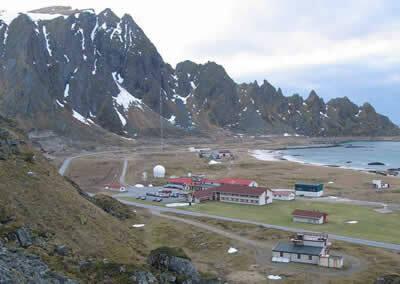 The intercomparison campaign of ground-based zenith-sky viewing UV-visible spectrometers was held at the Andya Rocket Range (69°N, 16°E) at Andenes, Norway, from February 12 to March 8, 2003. The site is a complementary NDACC site. Eight groups from seven countries participated in the campaign which focused on the measurements of slant columns of NO2, BrO, and OClO. A detailed description of the campaign can be found in Vandaele et al. 2005.
with main focus on: NO2, BrO, OClO. Intercomparison results for NO2 are reviewed in Vandaele et al. 2005. Considering the data obtained during the whole campaign for solar zenith angles between 75° and 95°, all instruments agreed within 5% in the case of NO2 (with imposed analysis parameters in the 425-450 nm region). Hofmann, D., et al. (1995), Intercomparison of UV/visible spectrometers for measurements of stratospheric NO2 for the Network for the Detection of Startospheric Change, J. Geophys. Res., 100, 16,765-6,791. Roscoe, H. K., et al. (1999), Slant column measurements of O3 and NO2 during the NDSC intercomparison of zenith-sky UV-Visible spectrometers in June 1996, J. Atmos. Chem., 32, 281-314. Vandaele, A. C., et al. (2005), An intercomparison campaign of ground-based UV-visible measurements of NO2, BrO, and OClO slant columns: Methods of analysis and results for NO2, J. Geophys. Res., 110, D08305, doi:10.1029/2004JD005423.